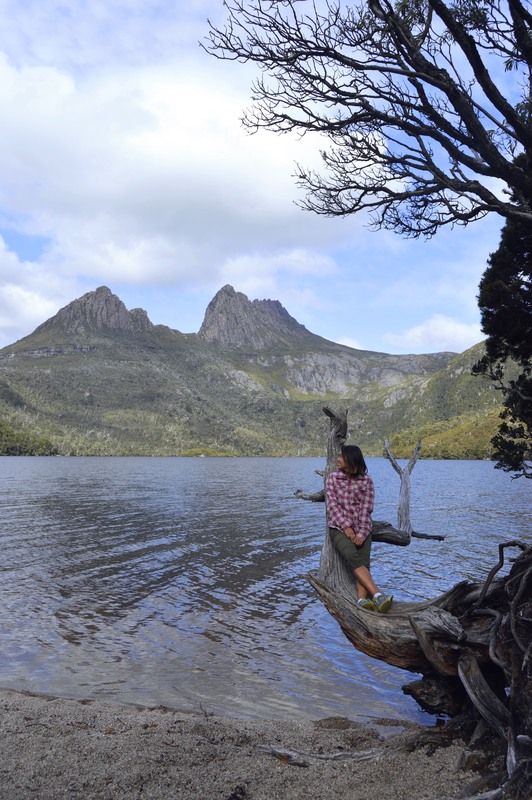 On to the mythical Tasmania! I didn’t know anything about Tasmania except that it’s where Tasmanian devils are from, so this was a pretty exciting time. 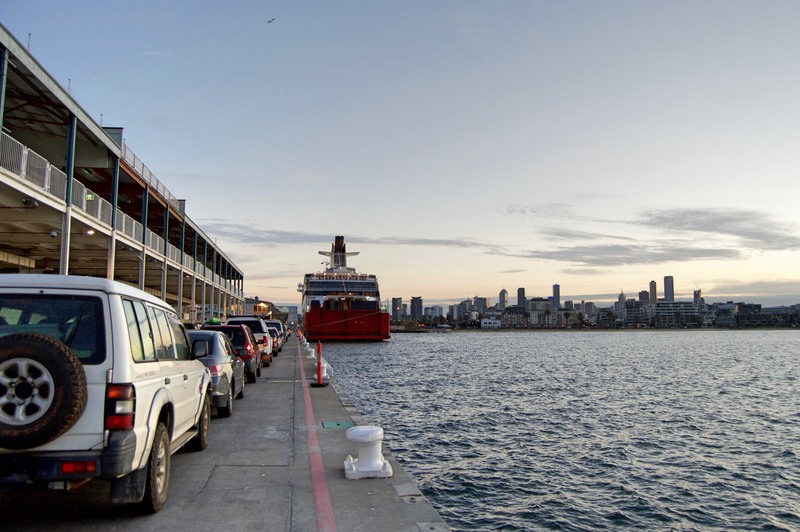 We decided to take our car over on the ferry, even though it’s significantly longer and more expensive than flying, because we didn’t want to be on tour buses the whole time just to get around. We took a day sailing on the way over since it was cheaper, even though the crossing is about 9 hours. Fortunately there was lots of stuff to do on board, including a little movie theatre, which was pretty cool though sitting in a dark room on a boat made Chris a bit seasick (even though I asked him MULTIPLE TIMES beforehand if he wanted a Gravol). Anyways, we made it to Devonport by dinner, where we celebrated our arrival with Indian food and spent the night. In line for the ferry at sunrise. 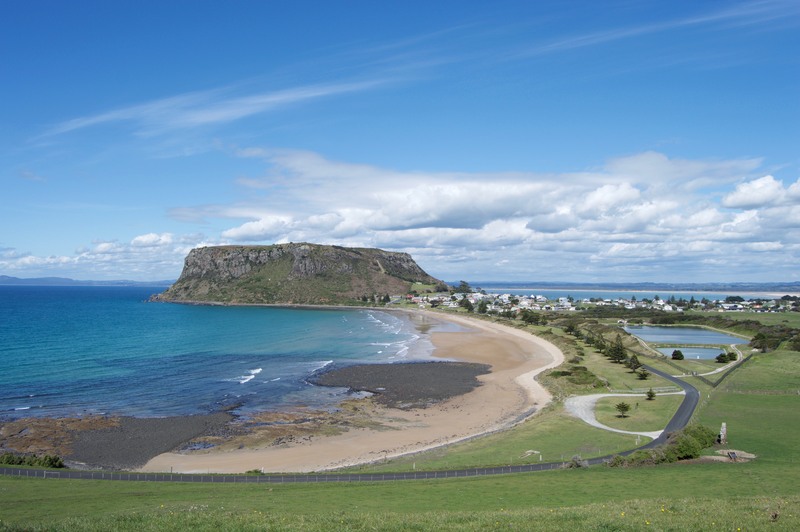 On our first day we decided to drive along the north coast to Stanley. 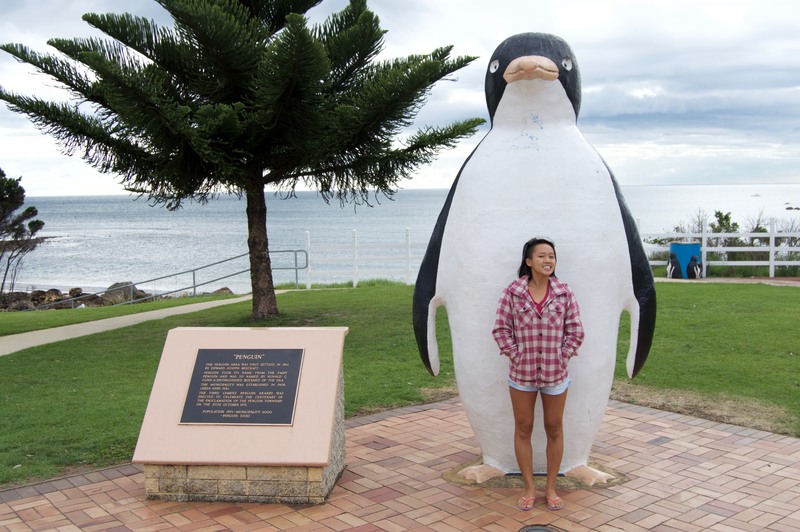 There are a number of cute towns on the way, one of which is called Penguin. So of course it had a statue of a penguin. It also had a bakery with sausage rolls that were like a meal for the entire day – so filling! A big pengiun in Penguin. 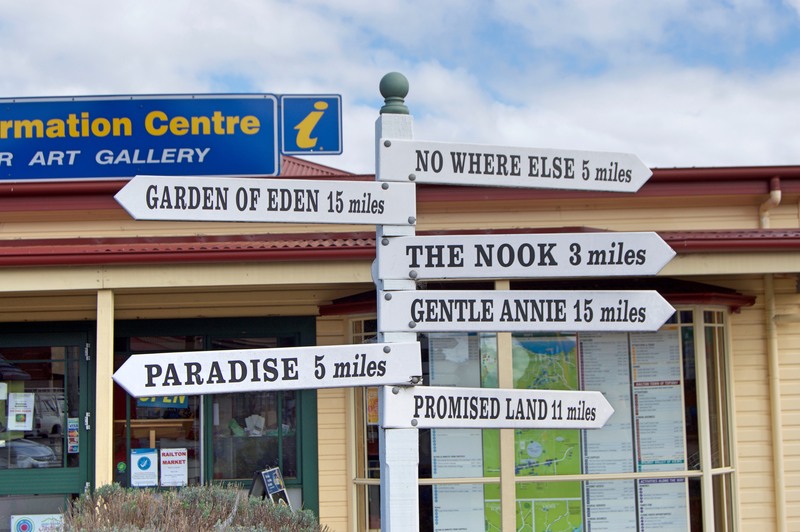 Cute town names seem to be a thing that Tasmania has a lot of, as we passed through some other pretty neat ones, including Nowhere Else and Promised Land. We had driven to Stanley mainly to climb the Nut. 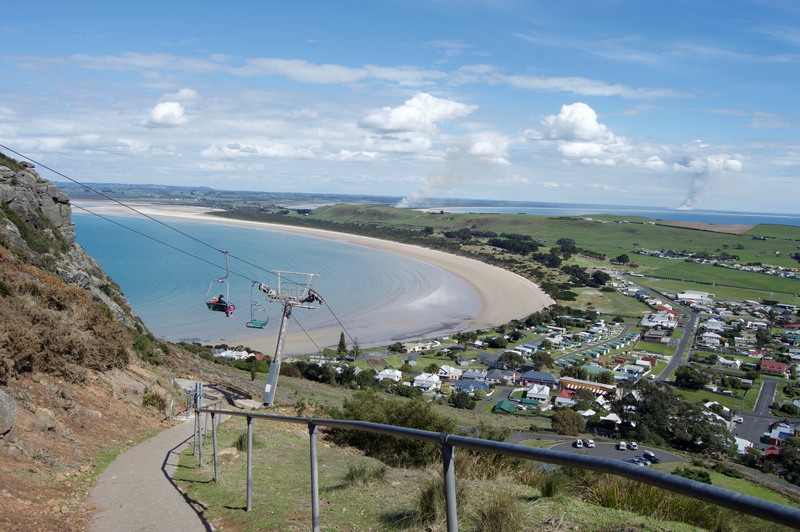 It’s the remnants of an old volcano and now you can get to the top via a chairlift or a very steep but short hike. 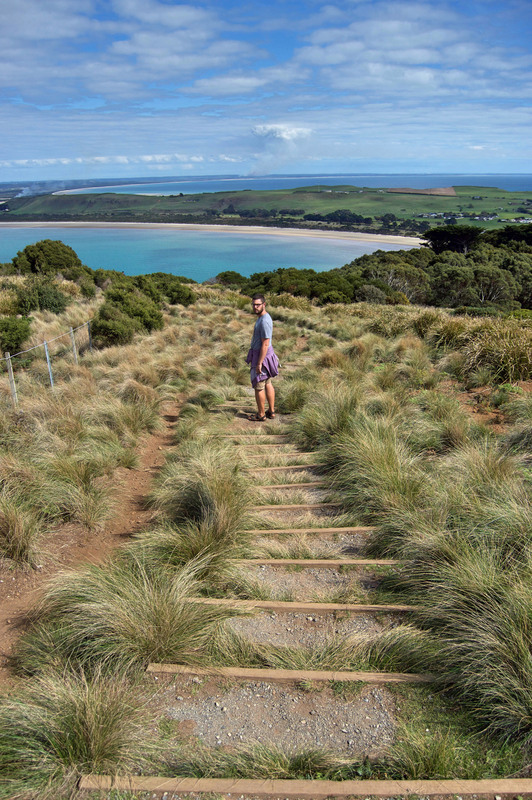 We went for the hike since we had just eaten those enormous breakfast pastries in Penguin. The trail wasn’t that bad, although if it ever snows you would definitely die trying to walk it. The hill has been nicely replanted with natural plants to bring back the native wildlife. At the top you can walk around taking in all the views. We also saw a couple little wallaby-like creatures. I think maybe they were pademelons? I am not very good at identifying hopping marsupials, mainly because before we got here I thought that kangaroos and wallabies were the only kinds. On our way down to Cradle Mountain I convinced Chris to stop at a couple places to look for platypuses (he was not really enthused about staring at rivers in silence and he didn’t believe I had the patience). We hadn’t had any success so far, but I was feeling optimistic. We didn’t see any at Fernglade Resever, but at Warrawee Conservation Park our patience was rewarded and we found one. He was super cute and we actually spent like an hour watching him paddling about, diving for food, and grooming himself. The grooming was pretty funny because he basically contorts his body and does all the grooming with his back feet. He can twist his legs to scratch his back, it’s pretty amazing. 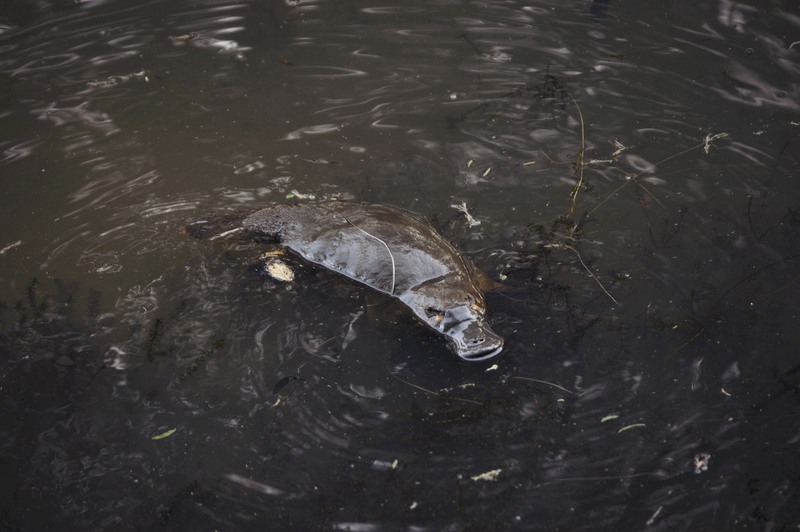 The diving was cool because platypus leave a trail of bubbles so you can follow their movement. He even crawled up onto a log at one point! Anyways we were pretty pleased to join the elite club of people who have seen a wild platypus before. 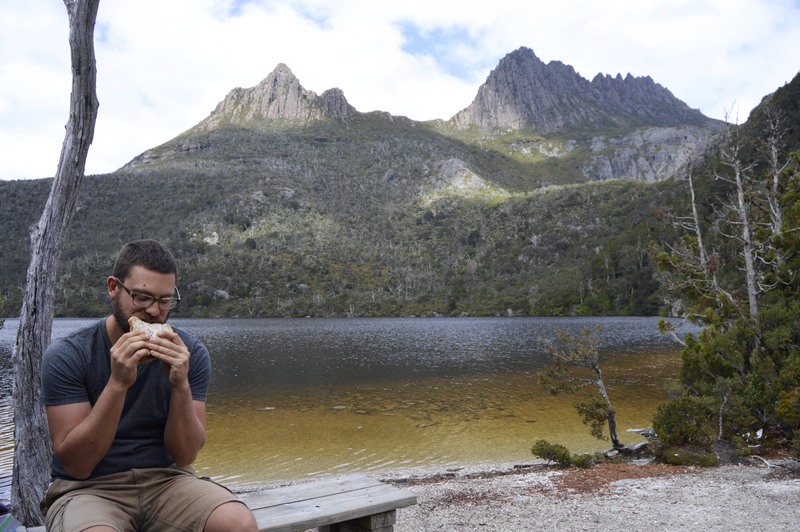 We camped at Gowrie Park, the campground closest to Cradle Mountain that didn’t cost a billion dollars (BIG4 parks have an annoying habit of parking themselves next to national parks and then charging double). We headed to the park early the next morning, originally contemplating doing the summit hike, but we got lazy (or smart, as Chris would say) and decided to do the scenic Dove Lake Circuit instead. It’s a bit of a production to get to the mountain, albeit a well organized one. I guess they didn’t anticipate the number of visitors the park would get because the parking lot at the mountain base is no where near large enough to accommodate all the cars, so instead they have a big parking lot and visitors centre about 5km away, with shuttle buses that take you to and from Cradle Mountain. Waiting for the bus is a bit inconvenient but not terrible (they come every 10-20 minutes), although you have to be careful if you get off at one of the intermediate stops, because at certain times of the day you will be waiting a while before a bus with free seats goes by. Anyways, we made it to the mountain in pretty good time and took a nice stroll around the lake. The scenery was pretty Alberta-like, although more rainforest-y in some areas. Chris’s favourite part was when we got to eat our sandwiches. Tasmazia is a big crazy maze-themed attraction that Chris really really wanted to go to. It consists of a bunch of big hedge mazes, some smaller mazes, and also a 1/5 scale city called “The Village of Lower Crackpot”. Seemed like a good place for photo ops, so we gave it a go. 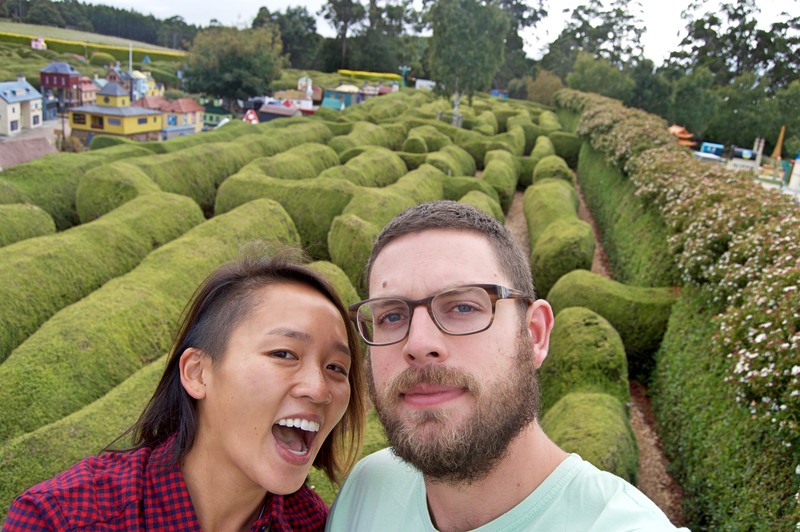 The large hedge maze was apparently at one point the largest in the world and was filled by lots of funny signs. There are two other mazes inside it including one that is a monument to the inventor of the toilet. They also have a scale replica of the Hampton Court maze. 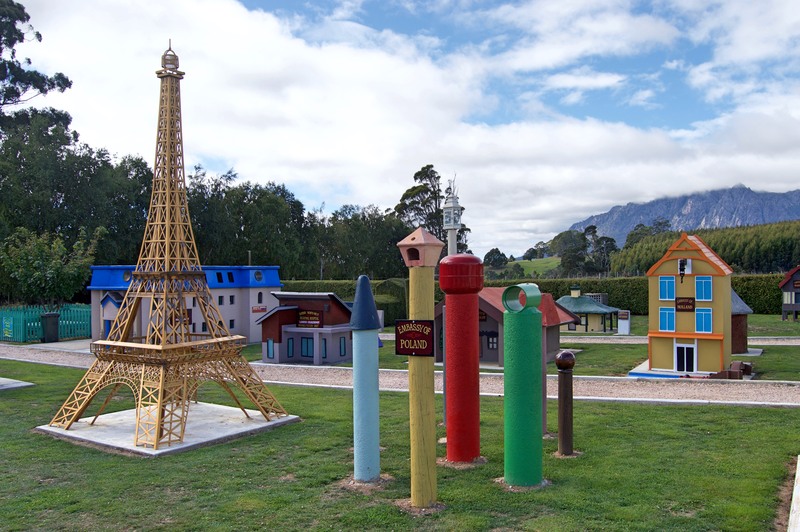 The village is also quite amazing – lots of joke-y buildings and such. There are also some tongue in cheek “embassies” (like a Stonehenge replica for the UK, etc.). Afterwards we had lunch there, where we got the LARGEST plate of pancakes ever with so much ice cream. And then had to go for a small nap. 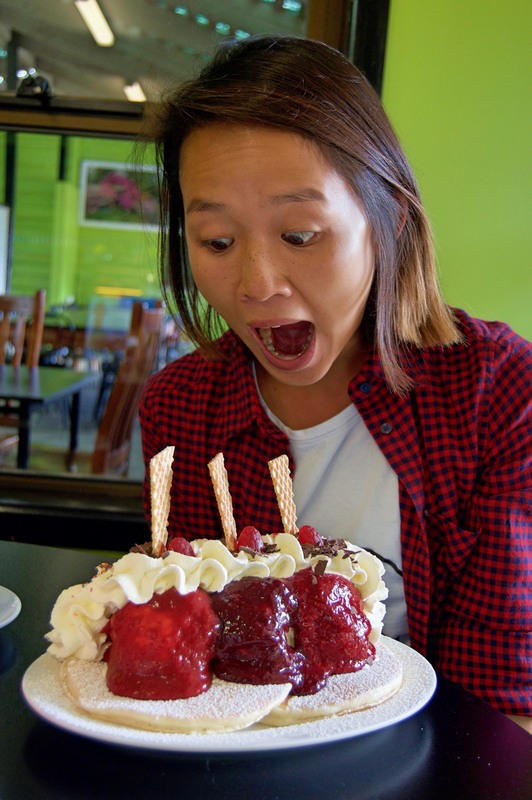 After we had stuffed our faces with pancakes we took a drive over to Sheffield. 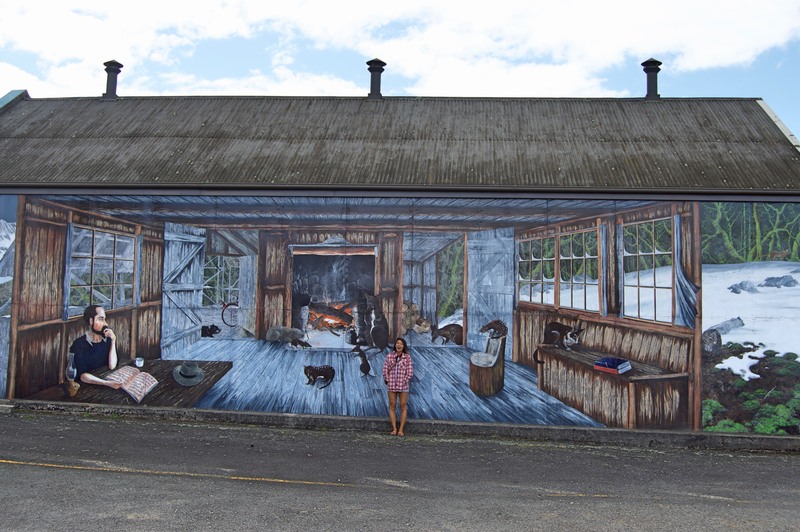 Sheffield is known as the Town of Murals and it was especially abuzz when we arrived because it just happened to be the week of its yearly mural festival, Mural Fest. 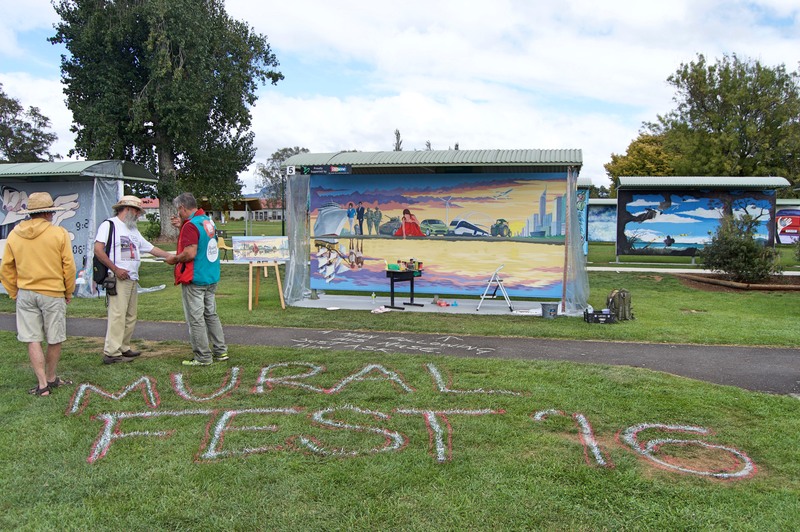 We had no idea what was going on, but some very enthused volunteers explained that a bunch of murals artist were in town; they would spend the week painting their murals and visitors would vote on which was their favourite. 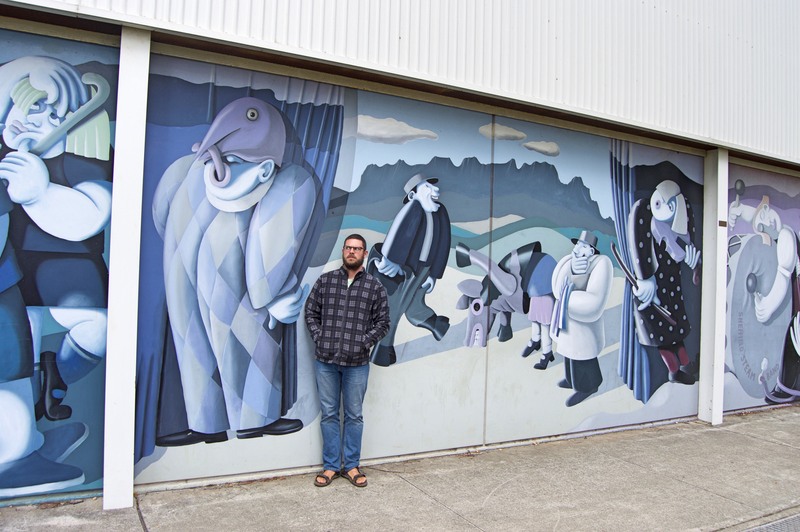 The winner would go in the hall of fame in Mural Park, the rest would be auctioned off and likely join the collection of over 60 murals that currently decorate the walls of the buildings around town. We took a walk around to watch the artists’ progress, and a very enthused volunteer got us to add a pin to her map of visitors, since we were 2 of 6 Canadians total that had visited so far. We relaxed after with some coffee and fudge. 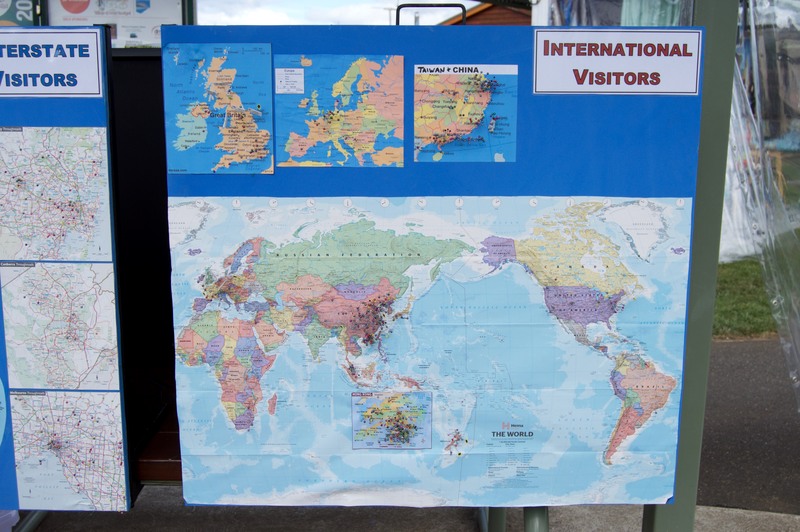 Adding our pin to the visitors map. 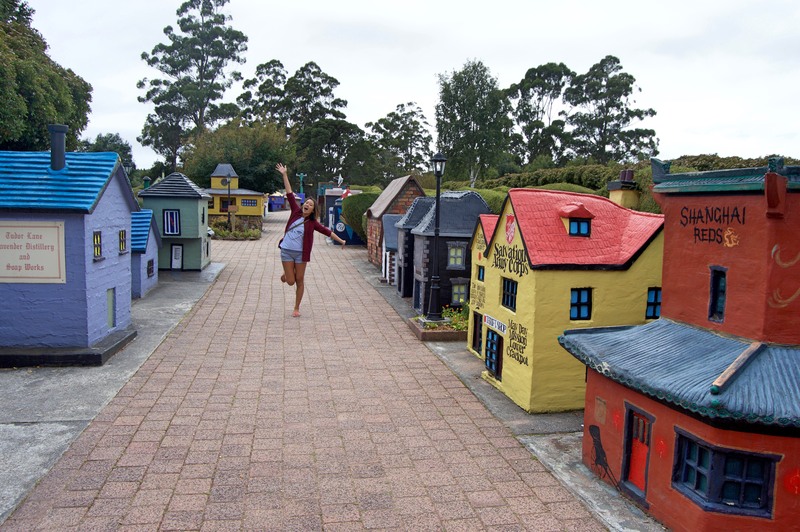 Before going to Launceston we decided to drive up to Beauty Point, where Platypus House and Seahorse World are the big attractions. 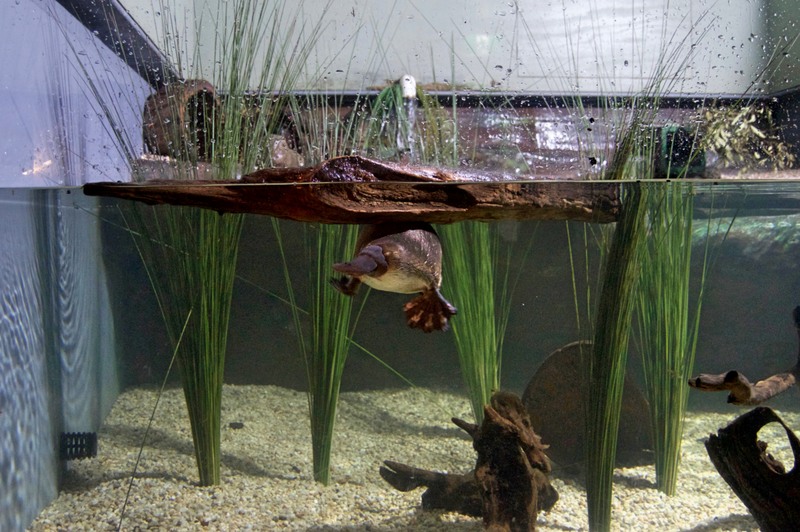 Platypus House is actually a monotreme exhibit, and has both platypus and echidnas. My favourites! Inside you get taken on a little tour, where they feed some snacks to both creatures. They have 5 platypus and 3 echidnas. The platypus were pretty cute, but I actually enjoyed the echidnas best, mainly because they basically just live in this big room, and you get to go in and watch them trundle around your feet. Super cute! They hang out right at the entrance door because they know they are going to be fed. Then they compete with each other to get the most food from the dishes. 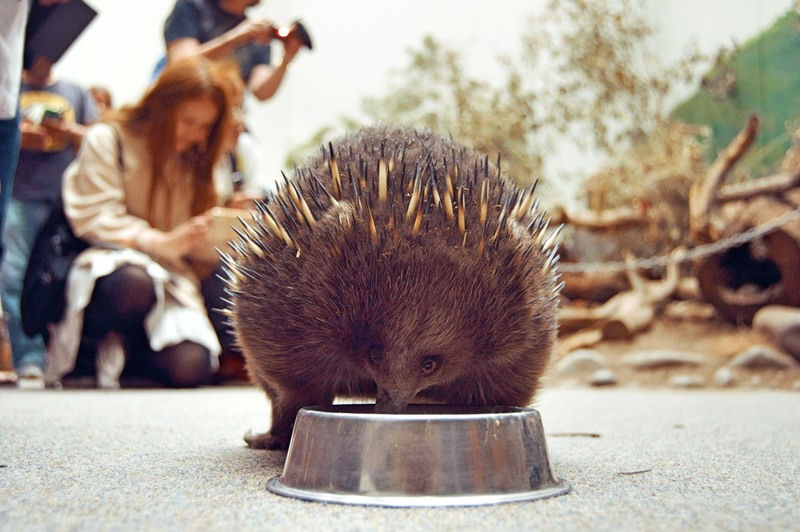 Interestingly, echidnas in Tasmania are bigger and furrier than ones on the mainland, because it’s colder in Tasmania. 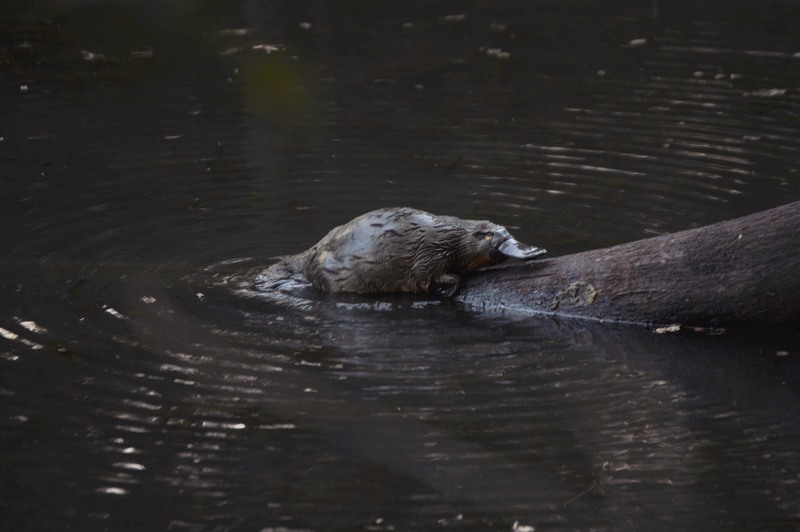 Platypus are also a bit bigger too. Seahorse World is actually a working sea horse farm, where they breed Tasmanian sea horses to sell to aquariums across the world. Christopher went through a phase last year where he wanted to put a seahorse tank in our apartment, and this visit brought back that fixation full force. Turns out the seahorses sold here are not that pricey (depending on the breed), but they only do bulk orders to locations outside Australia because the shipping process is quite costly and expensive (on account of seahorses needing a very specific temperature and only being able to survive in their shipping tubes for a few days). 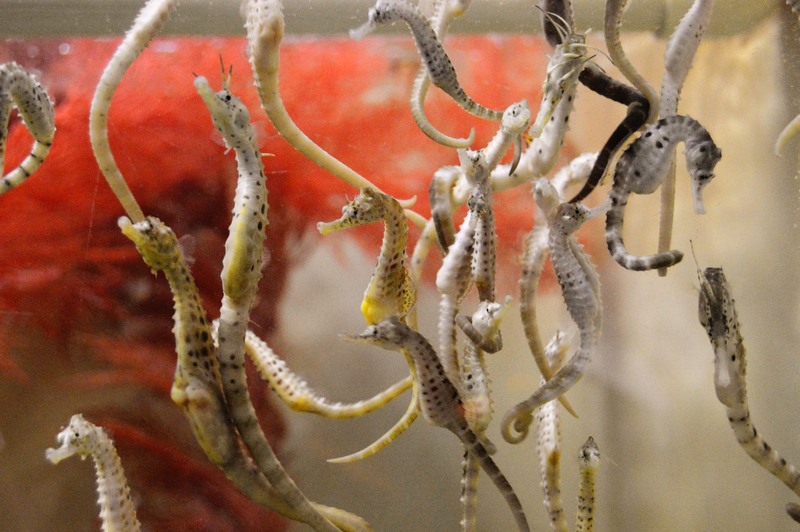 So no seahorses for Christopher, unless he wants like, a hundred of them (BUT DON’T GIVE HIM ANY IDEAS). Anyways, the sea horse farm has some very enthusiastic guides that give you tours. The first area is a display with all the different species of Australian sea horses. This is where we learnt that all seahorses can change colour to camouflage with their environment (but not to green!). 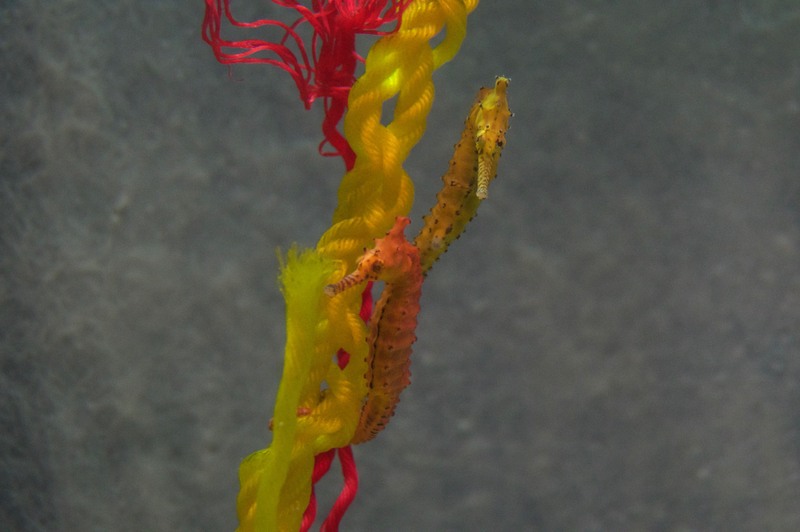 Daddy seahorses (or ones that are just showing off). The second area is where the breeding takes place. This was pretty much the most seahorses I’ve seen in my entire life. 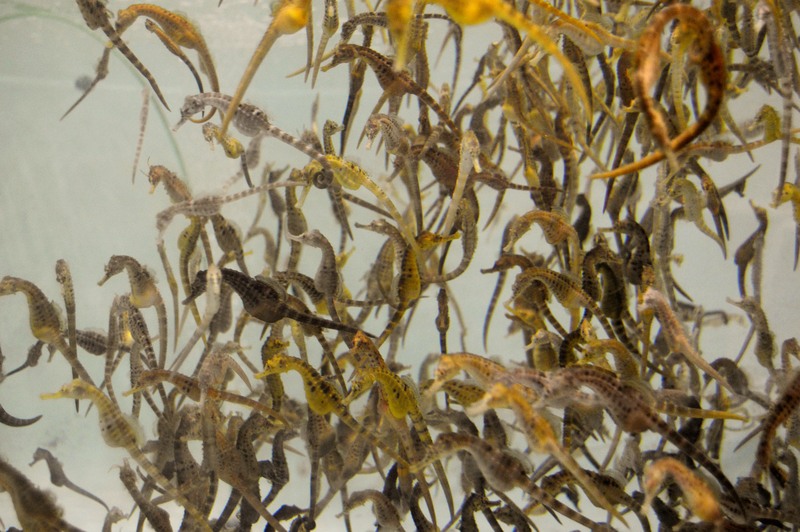 The seahorses court by dancing up and down their tank, so to stop them from breeding you just have to have a short tank. But as this is a working farm, most were actively breeding. 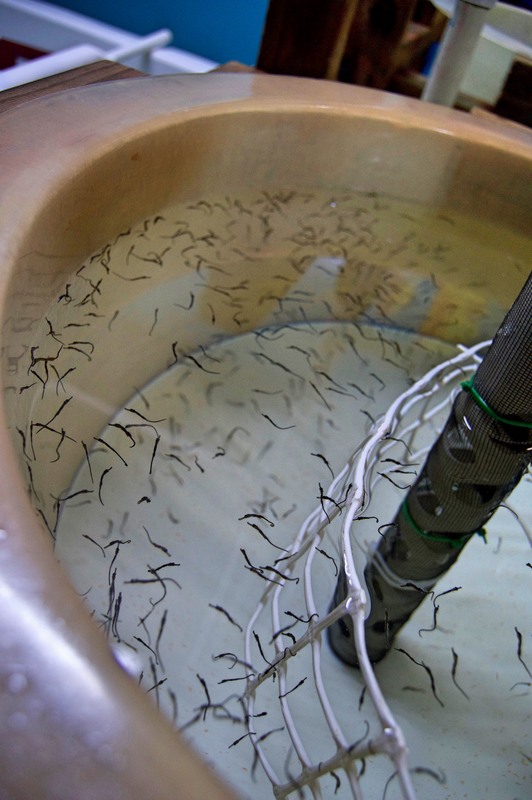 They feed the young ones sea monkeys and there are thousands of them in big vats. Then they get progressively moved from tank to bigger tank as they grow until they are ready to sell. In one area we also got to hold them, but Chris was sad because he was thinking his seahorse would fall in love and wrap his tail around Chris’s finger (instead it just zoomed away). We took a brief stop at Grindelwald, a Swiss-style village (built buy this Dutch immigrant who owned the supermarket chain that eventually became Woolworths), before heading into Launceston. Launceston is the second largest city in Tasmania. 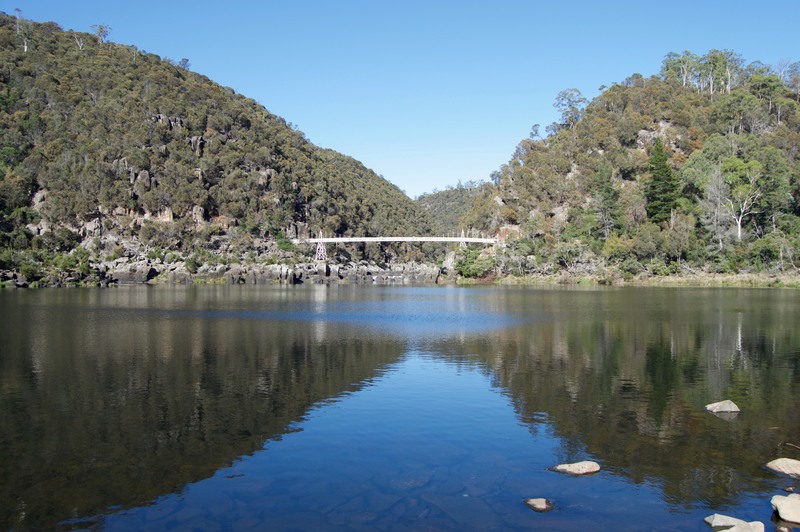 Its main attraction is Cataract Gorge, a pretty park right in the middle of the city where there are some cute cafes, the world’s longest single span chairlift, and lots of wallabies and peacocks surrounding the gorge itself. Launceston also has a nice city park, complete with a bunch of Japanese macaques. 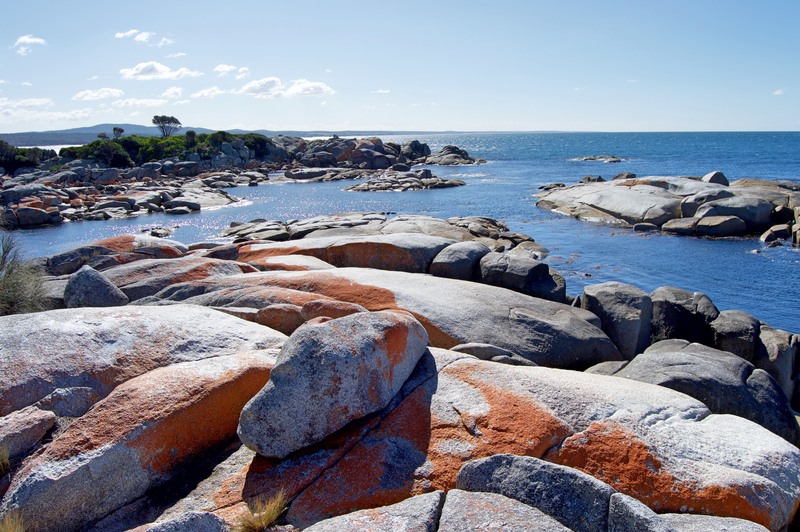 After Launceston we drove over to the east coast to check out the Bay of Fires. It’s a particularity pretty area because of the contrast between the blue sea, white sand, and red rocks. 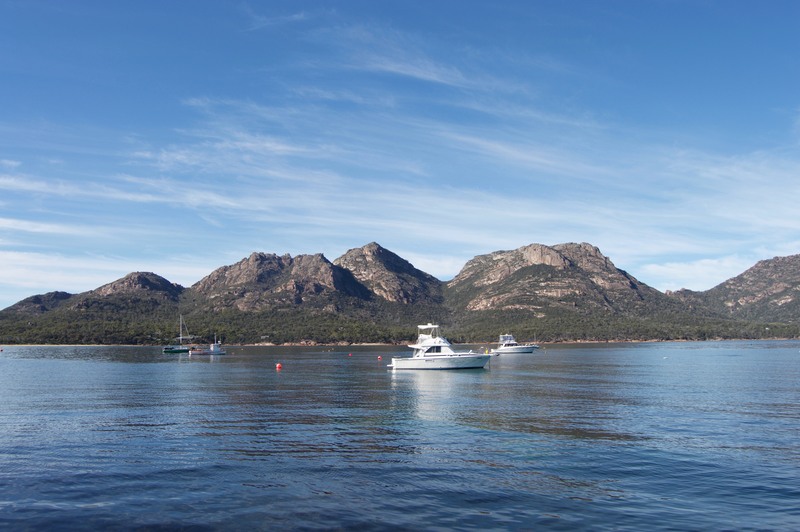 From there it was down to Coles Bay, a tiny town right outside Freycinet National Park. 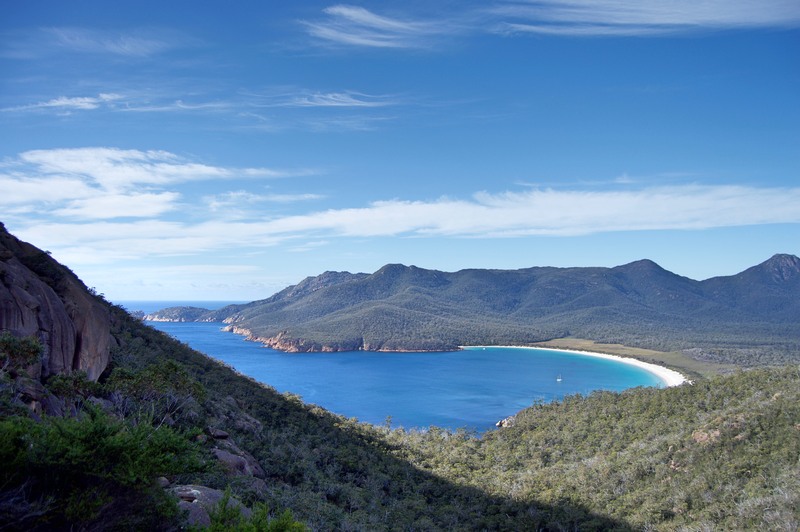 Freycinet National Park is the home of Wineglass Bay, one of the postcard pictures of Tasmania you always see. 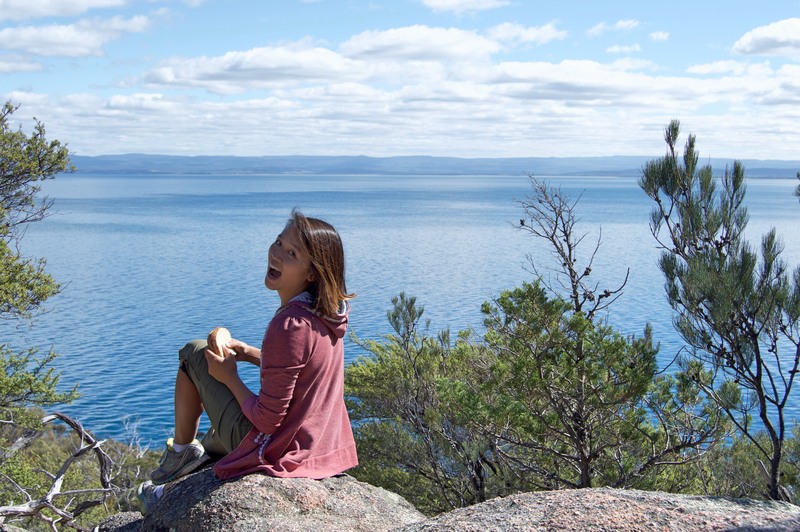 We were feeling spry (and had packed the all important sandwiches) so we decided to do the 11km hike to the lookout, Wineglass Bay, Hazards Beach, and back. 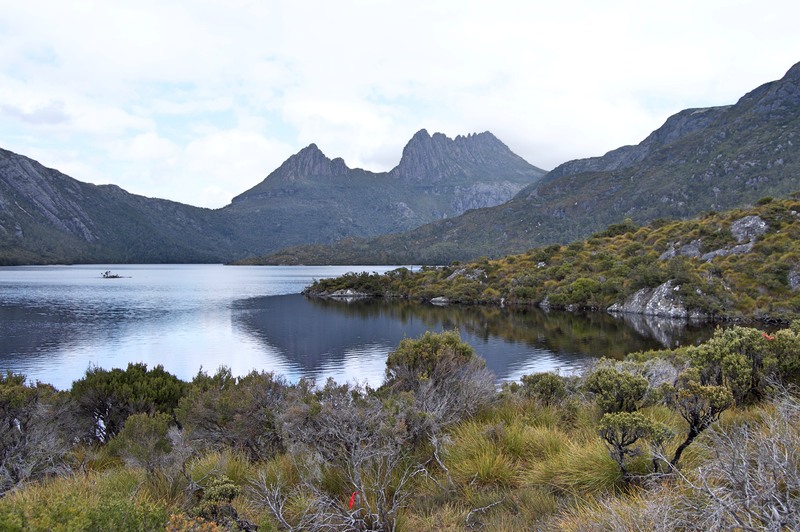 Tasmania in the fall is actually perfect hiking weather, so it was a nice walk with nice views. 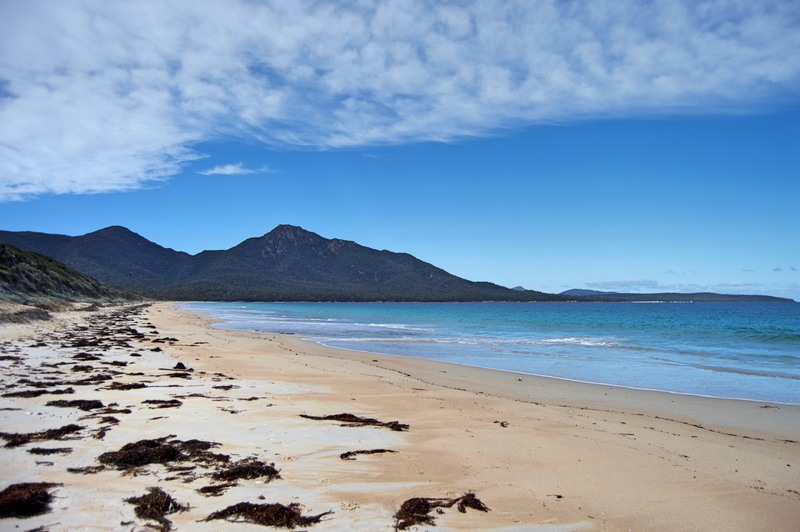 Freycinet Bay from the beach. The water is crazy blue, the beaches are long and white, and we even saw a pod of dolphins go by. To reward ourselves we went for ice cream, tea, and scones when we returned at this adorably-named cafe called The Pondering Frog. The husband and wife team that runs it are half retired. He used to run a vineyard and she was a chef, but now they have this little cafe and make excellent scones and chat with anyone who stops by. Back in Coles Bay we took a bit of a drive to look at the Hazards, four mountains along the edge of the national park coastline. 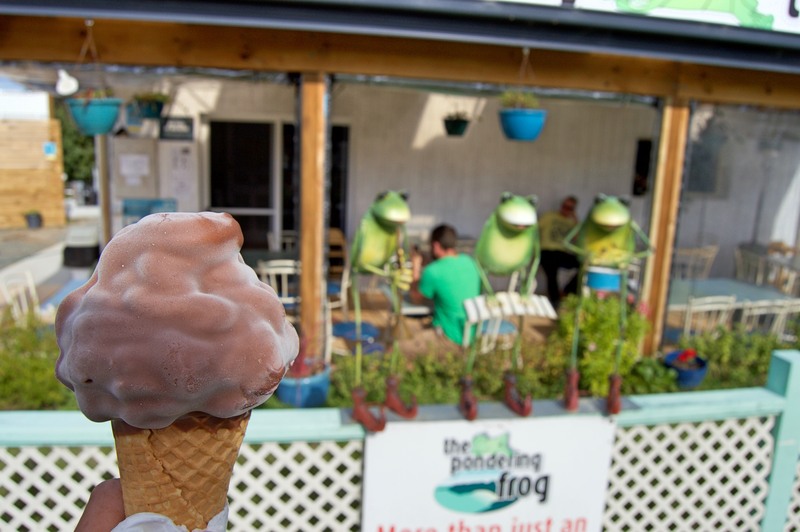 Ice cream at The Pondering Frog. After that it was time to head down to Port Arthur! On the way we passed by Tasman National Park, so we went in to look at some of the rock formations. There was an arch and blowhole, nice but nothing we hadn’t seen before. 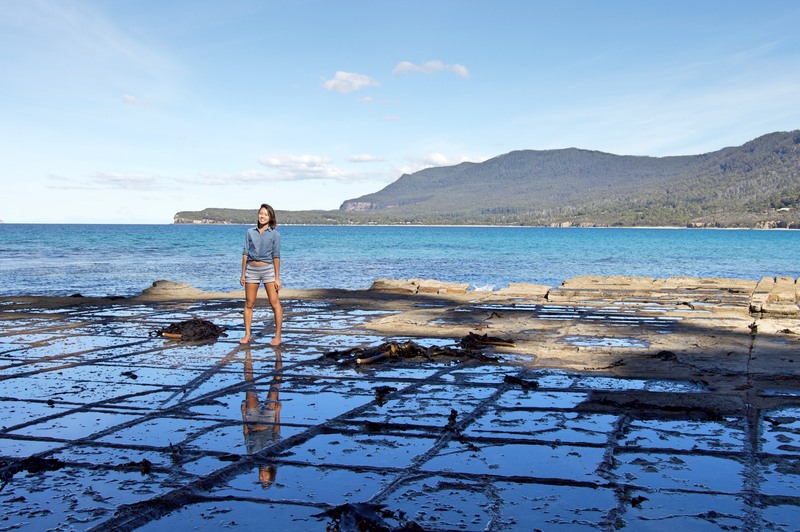 There was also some “tessellated pavement”, which is basically an area of coastal rock that looks like it’s been divided into squares, kind of. It is generated by the seawater pooling on top of the limestone and causing alternating areas of depressions (where the seawater pools and dissolves the rock) and elevations (where the seawater pools in the cracks to create islands) thus creating the cobblestone effect. 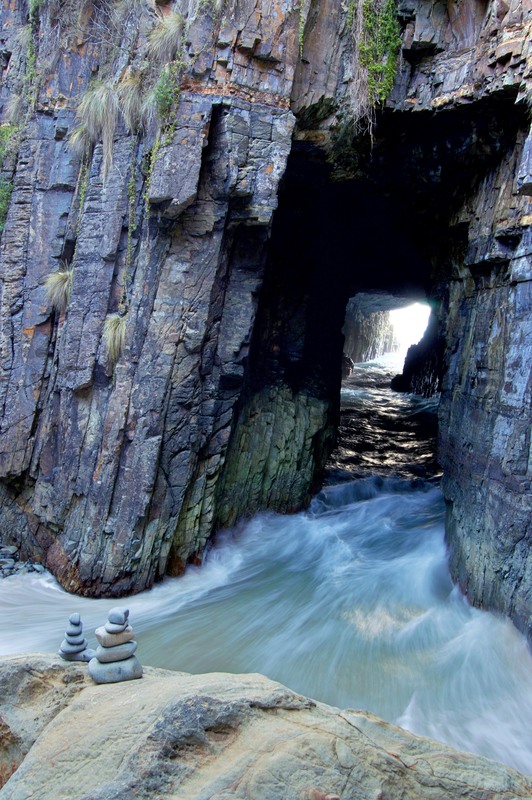 On the tip of the Tasman Peninsula is a pretty cool coastal cave called Remarkable Cave. The waves on this side of Tasmania are huge so it’s quite impressive when they surge through the cave. I had read that you can hop off the platform and look inside, but it looked a bit like you may get swept off to sea, so we decided not to. Then, it was on to Port Arthur! 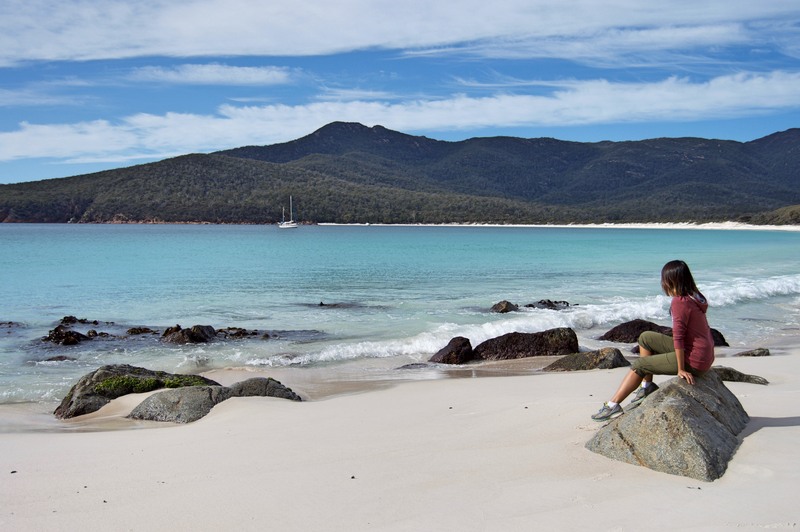 Great post about Tasmania! We did some of the same things. 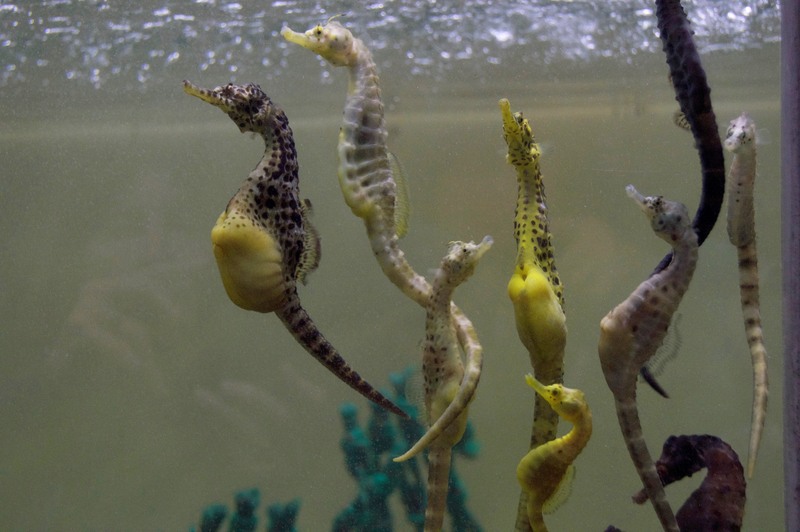 The seahorses seem neat. And the mural festival is a neat thing to stumble upon. I like how we went to those parks too and did some of the same hikes.